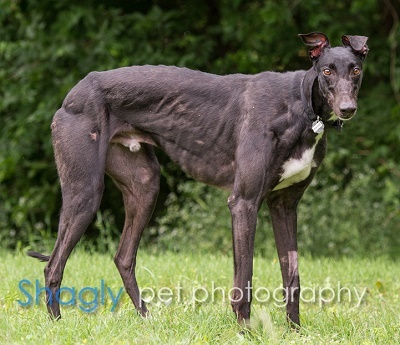 Rawhide, aka KB's Rawhide, is a 2 year old black male born March 2, 2014. His sire is Tyrur Alex and his dam is BI's Fast Pace. 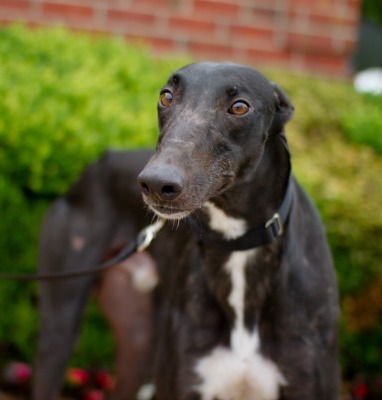 He has two races on record in February at Tuscon according to Greyhound-data.com. He came to GALT with the closing of the Tuscon track. Rawhide is not considered cat tolerant at this time. 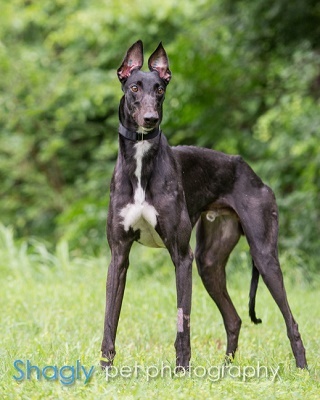 Rawhide is a great dog who is tall, goofy and curious about everything! He is very smart and is learning good house manners very quickly! He has already learned "wait" and "break" although if it's something that he REALLY wants, he needs extra reinforcement. He is still learning to play...he is timid of squeaky toys, and his favorite is the rope pull toys. He also thinks the bath mats are fun to take out but he never chews them. He is not a barker but he does nip a bit, when he gets excited. We are working with him to break this habit. He would love to be a couch potato but we have taught him not to do this in case his forever home does not want him on the furniture. He now happily lays on the many , dogs beds that are available for lounging! He is also a counter surfer and he thinks that if it's in his reach, it's his! He is learning that this isn't good manners and he's doing much better with consistency. Rawhide would much rather be wherever his people are then in his crate! He's excited when you wake up, when you feed him, and when new people come to visit. He loves a good chin rub but he's not a kisser. He walks well on a leash but sometimes he likes to stop and take in his surroundings. He also became house trained very quickly. There was not a peep from him during a thunder/lightning storm that took down a portion of our tree. He slept through the whole thing! He is currently living with a greyhound and a basset hound.